Save $10 on each set when you buy 2 or more sets or Initialed Charms. Choose a selection... Sterling small circle charm "a" Sterling small circle charm "b" Sterling small circle charm "c" Sterling small circle charm "d" Sterling small circle charm "e" Sterling small circle charm "f" Sterling small circle charm "g" Sterling small circle charm "h" Sterling small circle charm "i" Sterling small circle charm "j" Sterling small circle charm "k" Sterling small circle charm "l" Sterling small circle charm "m" Sterling small circle charm "n" Sterling small circle charm "o" Sterling small circle charm "p" Sterling small circle charm "q" Sterling small circle charm "r" Sterling small circle charm "s" Sterling small circle charm "t" Sterling small circle charm "u" Sterling small circle charm "v" Sterling small circle charm "w" Sterling small circle charm "x" Sterling small circle charm "y" Sterling small circle charm "z"
Made in the USA. The sterling silver charms are monogrammed with lower case letters that are scribed, pierced, and sanded by hand. 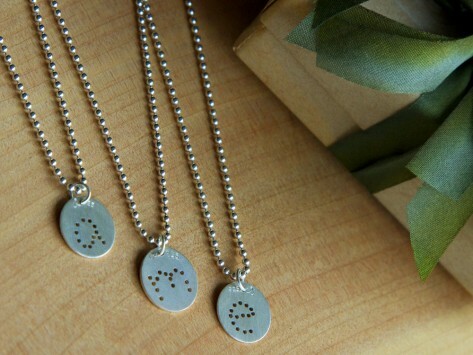 Each comes with a sterling silver necklace. Dimensions (in packaging): 1" x 1" x 1"
My wife loved it, which is all that matters. The necklace was beautiful. I ordered two initials. The order came in three days. Love it! Disappointing. I love the design. the charm is paper,paper thin. Way over priced item. Could make a fortune if you sold them for a lot less. Wear one all on its own or multiple charms at the same time to represent children, grandchildren, or siblings. As beautifully packaged as they are designed, these necklaces make for a meaningful gift that can be cherished for generations to come.